Reference number for this case: 21-Oct-54-Brest. Thank you for including this reference number in any correspondence with me regarding this case. has seen a "very luminous disc"
BREST, 25 (from our newsroom). -- In the area of Brest, a testimony worthy of faith on the flying saucers was recorded. It comes indeed from a senior officer, engineer of the Navy, which makes a point of remaining anonymous. Thursday, at about 8 o'clock, this engineer saw in the sky above the hills, between Plougastel and Landernau, a "very luminous" disc, which seemed to hover at 8.000 meters of altitude. Broad of one meter, to the naked eye, this disc appeared to be a biconvex lens. The wife of the officer observed, herself, the luminous point, while her husband was going to seek binoculars. But, when the engineer came back, a cloud was hiding the disc. "It was certainly not an atmospheric phenomenon, the engineer told us. And my scientific knowledge does not enable me to explain such a vision logically." A flying disc above Plougastel? BREST. -- An officer naval engineer, who makes a point of keeping anonymity, announced that Thursday towards 8, he had seen in the direction of Plougastel, a very luminous disc, being with approximately at 8000 meters of altitude. It was a kind of biconvex lens. His wife also observed the phenomenon and while the engineer was going to get binoculars for better observing the disc, it disappeared in the clouds. Luc Chastan indicates that in the Finistère at Brest on October 21, 1954, at 08:00 p.m. "A senior officer, naval engineer, saw in the sky above the hills, between Plougastel and Landernau, 'a very luminous' disc, which seemed to hover at 8.000 meters of altitude. One meter wide to the naked eye, this disc seemed a biconvex lens. The officer's wife observed, het too, the luminous point, while her husband was going to get binoculars. But, at the return of the engineer, a cloud hid the disc. 'It was certainly not an atmospheric phenomenon, the engineer told us. And my scientific knowledge does not enable me to explain such a vision logically." Luc Chastan indicates that the source is my website: "Les OVNI vus de près par Gross Patrick ** http://ufologie.net" (This being the old URL of my website's home page). The website indicates that on 21 October 1954 in Brest, France "Hovered." And: "A hovering object was observed. One object was observed by one witness." Probably the 08:15 p.m. meteor of that day. [of1] Article in the regional newspaper Ouest France, Bordeaux, France, October 26, 1954. 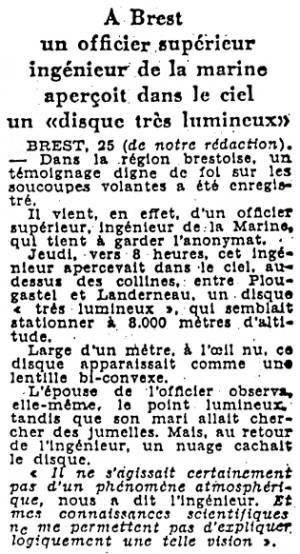 [lm1] Article in the regional newspaper La Liberté du Morbihan, France, page 9, October 27, 1954. 0.1 Patrick Gross November 14, 2005 First published. 1.0 Patrick Gross January 12, 2010 Conversion from HTML to XHTML Strict. First formal version. Additions [lc1], [ud1]. 1.2 Patrick Gross February 7, 2017 Additions [ub1], [vo1]. 1.3 Patrick Gross January 2, 2019 Explanations changed, were "Not looked for yet."